This exquisite limited edition print represents Team Brawn in the 2009 Formula 1™ season. Featured on the print are F1™ drivers Jenson Button and Rubens Barricello were photographed by the artist. 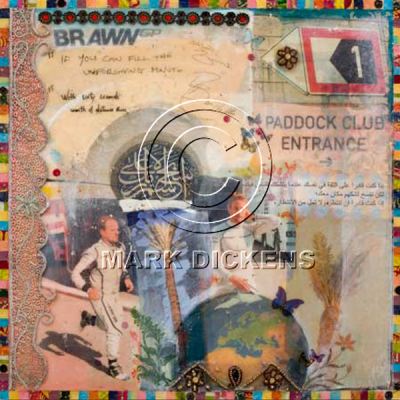 Mark Dickens displays a beautiful scripture from the Sheikh Zayed Mosque, a large globe of the world and signage for the Paddock club. To represent the Formula 1™ team he includes the racing Brawn F1™ car. He also incorporated decorative tile designs taken from within the Sheikh Zayed Mosque throughout and pieces of local fabrics to create a stunning unique border around the print. 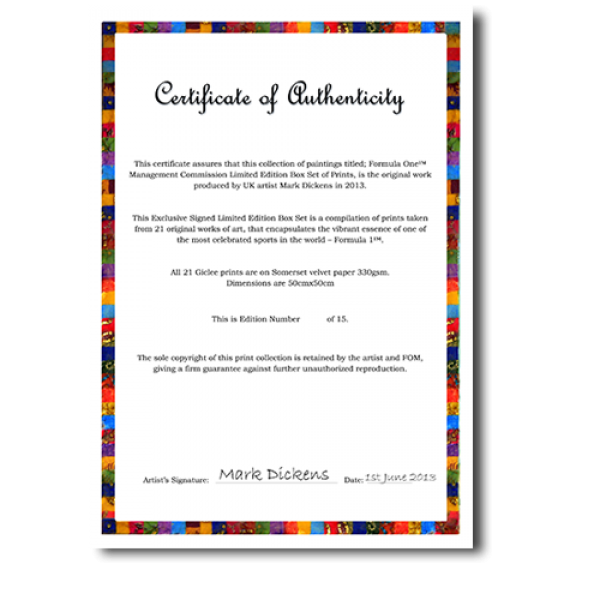 Mark Dickens invited Jenson Button and Rubens Barricello to hand-write segments from Rudyard Kipling’s poem ‘IF’, which appear on the print in both English and Arabic.